What are Koi fluke symptoms? The symptoms of fluke parasites on Koi fish are many. Look for fluke in Koi fish that exhibit these signs: lethargy, redness or irritated skin, excessive mucus covering on skin, isolation and weakness. You will notice that your fish become thin to emaciated, become listless, and see the appearance of a milky film surrounding the fish. This is referred to as ‘gray slime disease’ and is the Koi’s response to the aggressive feeding by heavy infestations of the parasite. 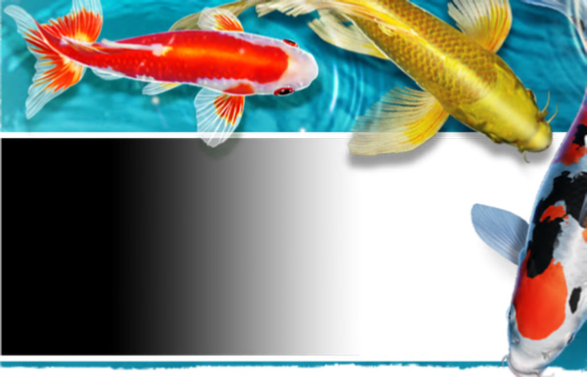 Scraping or rubbing in an attempt to rid the pests are also symptoms of fluke parasite on Koi fish. Bacterial infections may follow advancing to ulcers and scars. How long do fluke parasites live? An adult fluke’s life span will range from two weeks to one month. However, in cold pond water the eggs, larvae, and the adults are capable of hibernating for up to 6 months. Dactylogyrus, the gill fluke parasite in Koi, is recognized by 4 tiny eyespots on the head. It also has hooks on the foot that it uses to adhere to tender gill membranes. The parasite stretches out and feeds on mucus and filaments in the gills. Heavy infestations mutilate the gill tissues causing them to become disfigured and build up scar tissue. Over time parasitic activity will interfere with breathing and gill function. 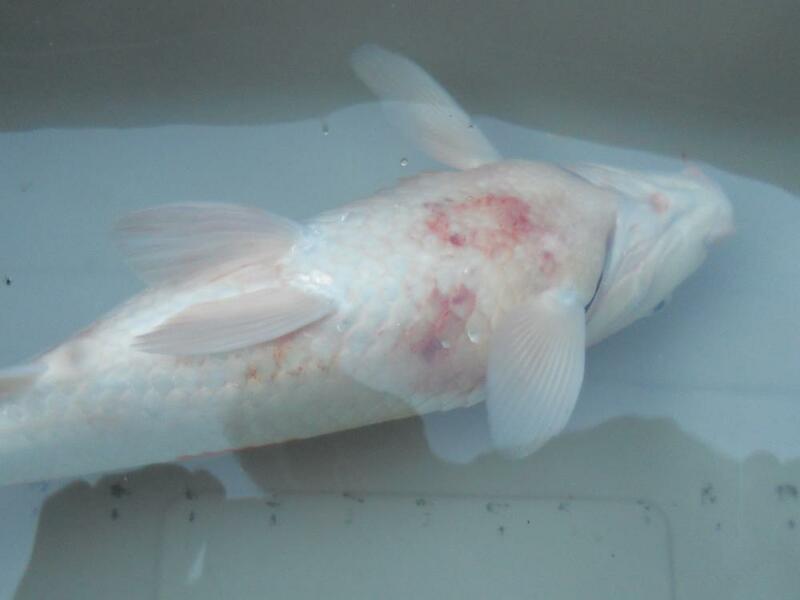 Extensive damage to gill tissue results in reduced oxygen transfer to the fish’s blood supply, making the host Koi becomes listless. Dactylogyrus breed in the gills and deposit its eggs within the gill filaments. An adult gill fluke is capable of laying up to 20 eggs per hour in 75⁰F water. The eggs are then swept out into the pond water by the fish’s respiration; water flowing across the gills as it breathes. The eggs will hatch within a few days depending on the water temperature and the tiny larvae begin their hunt for a host immediately. Juvenile flukes can live for 3 days in free-swimming mode while searching for a suitable host. These offspring will become mature in 10 days and begin reproducing to create many more blood-sucking parasites. 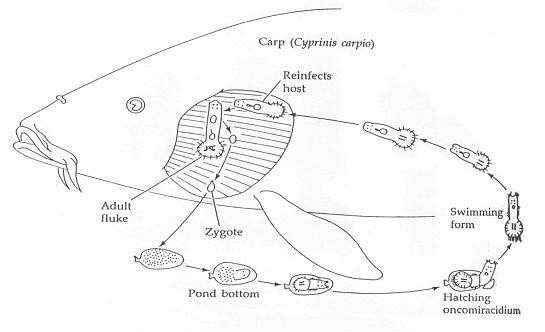 Koi Fish Skin Fluke: Skin fluke parasite, Gyrodactylus, is physically similar to gill fluke; the body shape is the same and it also has a series of gruesome hooks called haptor for attaching to the Koi. However, it has several differences. Gyrodactylus Koi parasite is generally found on the body or flank rather than on and around the gills of a host fish. 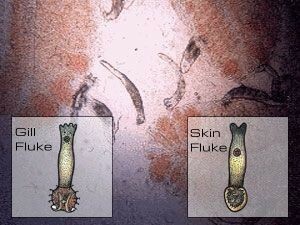 There are no eyespots on the skin fluke. The Gyrodactylus parasite gives live birth rather than laying eggs. The gestation process is continual; as one larva is delivered several more eggs move into the female’s uterus to develop. The maturing embryos are identifiable within the body cavity of the adult Gyrodactylus and larvae will emerge in approximately 5 days. Young fluke larvae get busy dining on the host Koi immediately following emersion from the uterus. 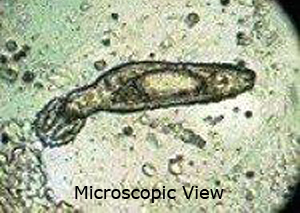 Skin flukes may occasionally be found in the gill region of the host, and likewise, gill flukes might show up on the skin of the host fish. Regardless, both types of fluke parasites will adhere to an unsuspecting host to feed and breed, and will be detrimental to the fish’s health.